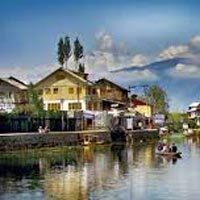 After breakfast proceed for full day tour of world famous Mughal Gardens visiting the Nishat Bagh (The garden of pleasure) and Shalimar Bagh (Adobe of love), Shankaracharya Temple, Pari Mahal, Hazratbal Shrine .In the afternoon Shikara ride on The Dal Lake to enjoy the beauty that God has graced this city. You will get a view of some very interesting places around the Lake. Overnight stay at Deluxe Houseboat / Hotel. After Breakfast drive to Sonamarg, Enjoy full day trip to Sonamarg (Meadow of Gold) also called Gateway to Ladakh. Sonmarg with altitude of 2690 Meters is the most beautiful drive from Srinagar. One can ride on horse to visit to Thajiwas Glacier where snow remains round the year. Return back to Srinagar. Overnight Srinagar.